UNC Charlotte initiated a new tradition for commencement 2018 with the first-ever doctoral hooding ceremony. This event, held Thursday, May 10, was the first time that doctoral students were recognized with a separate ceremony from the main Commencement exercises. Students’ faculty advisors also participated in the ceremony. 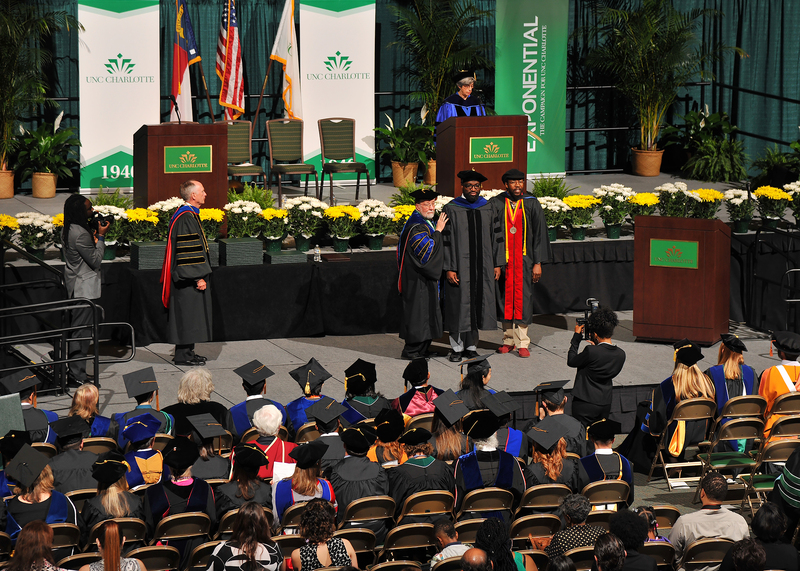 This novel doctoral hooding ceremony underscores the growth of UNC Charlotte as a research institution. “Since awarding its first doctoral degree in 1997 in electrical engineering, the University has grown to host 23 doctoral programs enrolling more than 850 students each year,” said Chancellor Philip L. Dubois. For 2018, 75 doctorates are being awarded in 17 different disciplines. Since 1997, the University has awarded 1,326 doctoral degrees. Click through the slideshow below to view more photos from the doctoral hooding ceremony.